Army Welfare Education Society (AWES), has released notification for bumper vacancies of teachers in 137 Army Public School. APS invites application to fill up vacancies of teachers in different streams / subjects in various Army Schools. Note : Exact number of vacancies will be released by School’s Management while advertising for holding interviews/ evaluation of teaching skills. An Online written test (Combined Selection Screening Examination) will be conducted on 26 & 27 Nov 2016. Candidate who achive 50% marks will shortlisted for interview. Selection of candidate will be based on overall performance. Candidate will have to pay examination fee of Rs 600/- (which is non refundable). Interested candidates are expected to register ON-LINE for the screening exam by logging onto the Registration Portal http://aps-csb.in . The registration portal will be open from -17 August 2016 to 13 September 2016. Candidates can register from 9AM on 17/8/2016 to 5PM on 13/09/2016. 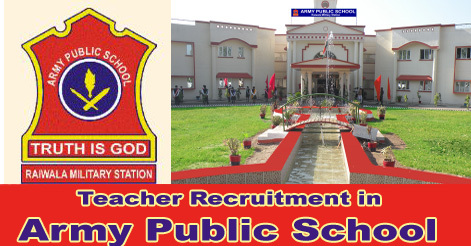 Help us to improve this article/job posting "8000 Teachers Recruitment in Army Public Schools". We would be glad if you can comment below and provide your valuable suggestions and feedback. If this page have any wrong information/list or out of context content, then you can report us as well. Can I apply for this post . I am post graduate from economics and qualified the cs inter exam ..and I don’t have BEd degree..but I have experience of teaching in schools. M.A. human rights; b.ed Hindi,social studies .shahid bhagatsingh Nagar Punjab. Can I apply for this post.I m post graduate from chemistry. Respected sir. Myself post graduate in law. Am I eligible for teaching in your school. No use of the best. I have also cleared the test but they chargers all the time for every branch n take interviews of all the posts same day. I too went for interview but didn’t give because the call at 8am but till 4pm no interview was taken as interviews for all the posts were on same day. They conduct computer test but whoever not cleared also called for interview. I didn’t get their criteria. i kamla mehta become a teacher in army public school.